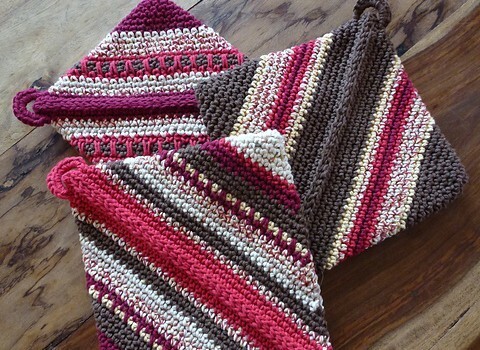 Homepage » Free Crochet Patterns » [Free Pattern] Grandma’s Hotpats: The Flat Out Best Potholders Ever! There must be something with grandmas making these hot pads! This Double-thick Diagonally Crocheted Potholder by Andrea Mielke is quick and easy to make and lasts forever! Not really, but you get the idea. It’s also a pattern that looks like the one grandmas use to crochet. Make these simple yet interesting potholders to use your scrap thread and have fun varying sizes and adding stripes. Thanks to Andrea for article inspiration and featured image. 300 Comments to [Free Pattern] Grandma’s Hotpats: The Flat Out Best Potholders Ever! I would not normally use gray, but, these are gorgeous. I love making these. My grandma taught me how. I’ve never had a pattern,but I’ve probably made a hundred or more. I have some that I made like this yet! I make new sets every couple of years for Christmas for everyone, they are quick and everyone wants them. You can make these any size and use for the table, to put hot dishes on. 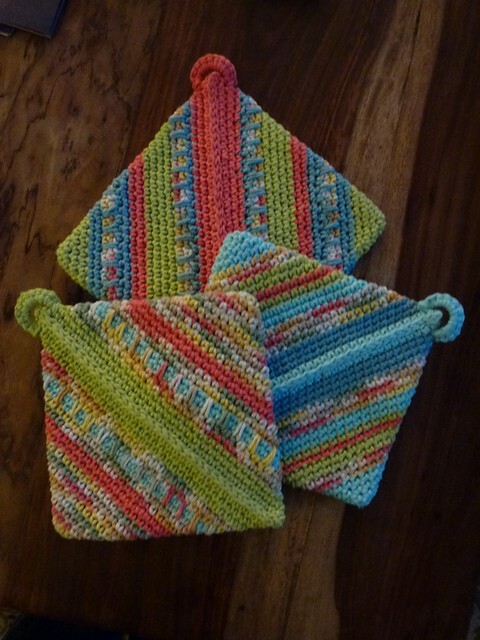 I love these, made smaller potholders with ch26…. These are the best I have ever had and so easy to make in crochet!!!! Just a few on last year’s stock of potholders. Probably made 4 dozen in varying sizes for the craft table. People were asking for pairs, so I’m doing that this year. Been making them forever. First of acrylic, then cotton, now from my hand spun wool. First thing I learned to crochet! Have made tons of these!! Great gifts! Luv em!!! I’ve made several of these throughout the years. Easy pattern and potholders very durable! Of course I made tons of them! Love this pattern! Got it from Mavis Peterson! Sold many!!! That’s awesome! Thanks for sharing Thecla! Beautiful! Well done Trish! Thanks for sharing! My grandma never wore hotpants? I remember these when I was a young girl. Can’t wait to make some. I’ve been making these for years!! Same comment Ruth Hegreberg. Everyone wants them taught a lady to make really large ones for a soup kitchen. I have made these in different sizes and given them as gifts. They are great. Made them first with Grandma Babe when I was 10ish??? i learned to make these from an 80 yr old woman that i cleaned house for. made many of them. I have made these for years . I start with a chain of 32 though.It is also known as Turn on Itself potholder !!! Love this pattern. No two ever turn out alike, especially when I use my scraps. I’ve been making & selling these for years. Got some of these for sale if any one is interested. 2 for 5.00 dollors plus postege. ohhhh going to make some of these!! My grandma used to make these. Making thses for girls at work with hanging towel and some bath and body works soaps. Affordable! Perfect for a travel project. I always include some with a bridal shower gift. I’ve had the bride ask for more after a few years. These are a great hostess gift too. I usually have a few sets ready to go. I have one that my grandmother made. I have made these for a long time ! They are so handy to have ! I have made many of these through the years. And I still have and use daily several that MY grandma made. She’s been gone almost 20 years and I’m a Granny myself now!!! I cannot get the pateern to download Help please. I’ve made more of these in my life than anything else. I love this pattern, I have done it so many times and it is so easy. Thank yyou for the free pattern! My grandmother made these . They are the best. This is how I make them, just before closing it up, I cut a piece of insulbrite (sp) and put it inside. It TOTALLY stops the heat from burning your hands. Do you have to tack the insulbrite down to keep crom bunching up in wash? This stitch really protects your hands. I just made about 50 of these this past fall for gifts and an organization that gives out gift food baskets each year… So fun and easy to do.. They look great Linda! Awesome job! <3 colors...would match my kitchen perfectly!! I’ve been making these for years. I’ve made these, years ago !!! How do you make the hanging loop so round? I made these years ago and loved them. I used to ride my schwinn down to the ferry terminal to go to Ketchikan. I would make these at my grandmas house all weekend long. Had tons of them. Was fun to see the pattern emerge fr the variegated yarn. best potholders EVER! I’ve made many. These are great. Made bunches and bunches. Make bobble or popcorn stitches on one “side” and you’ve got a even more protection. I’ve made dozens of these, and you are right, they are the best potholders ever! go one step further. I put heat resistant material inside. what are the colors used in the above pic? I love those colors together! I love them! Have a friend with BIG hands and could make this to fit him, he is very happy! These truly are great. I make them for gifts and for myself because they last so long, no matter what you do to them. I made these a long time ago…still have them. i MAKE THESE KIND OF POTHOLDERS AND GIVE THEM AWAY THEY LIKE THEM AND THEY ARE EASY TO MAKE. OUT OF COTTON YARN . I’ve been looking for this pattern for years! My grandma used to make these. I love this pattern and everytime I try to load it gives me a virus…. question is there a source I don’t know about? Ella Irving overtime I use mine I think of you. Thank you for your thoughtfulness. I love making these no brainer hot pads. They are quick and easy to make and are perfect for any kitchen!! Made several as Christmas gifts with matching hanging towels! Easiest pattern ever! What an awesome idea! Great for babies on the floor also! I m going to get busy and make these. I don’t know when but at least this year. been looking for this pattern. Thanks! I love these. I need to make some more! They are the only potholders I use…and they use up every scrap of leftover cotton yarn! Yes they are, and easy to mske. My daughter made me several before she passed away. Now my daughter in law makes them for me…. My dear friend Barbara used to crochet me these for Christmas. She passed away( miss her so much) but think of her and the love that went into each stitch each time I use them!! I have been making these for years. They are the best. Beth England make me some. I will send you money for the yarn and shipping. Just tell me how much. I hate when you want to get a pattern and it send you to other patterns you don’t want!!! Thanks for sharing this pattern !! I make these, too! Everyone loves them. Can’t make them fast enough. Linda Henning Wren look at my post above for the pattern. Do you put insul bright in them? Made these by the bucket load! They’re the best! Great way to use up leftover yarn. Any they are functional potholders. I love them and make them for others. I’ve got one I made 20 years ago… still going strong!! I was in a swap and made a couple of these… got in trouble because they weren’t cotton and “would never hold up” HA! Your loss! Love making them and a good use for that pretty yarn that you love but aren’t sure what to make with it! Quick and easy for some–a group I’m not part of. Linda Henning Wren. At the end of crocheting. When you are leaving an end to sew together, leave a little extra. Sew the seams together and at the end of sewing make a loop and chain around 10 or as long as you want. Attach to top. Weave in end. I don’t crochet any more except to do these. The only ones I use! I have made so many of these over the years, they are so much fun to make. Better and safer made in wool! Cotton is flammable! Wool is the safest! Cotton won’t melt like acrylic, but it is flammable! I use a 7.5 hook, ch 35 w worsted cotton. Best. Hotpads and potholders. Ever! What is insulbrite and where do you get it? Terina Guess what is insul bright? I always chain a loop at the end before I sew the edges together. Good idea! My dog chews up every bed I give him, maybe he’ll leave these alone! This is the pattern I use, I have no idea where I got the pattern or if there was a pattern I was given. The pattern that started this conversation adds stitches to the end of the chain at the beginning, I have never done that, I also always chain about 10-20 chains at the end, then sew the edges together. I’ve been doing these for over 30 years! I make them all time. Have made these for over 20 yeard..quick n easy. I have made alot of these. A very easy pattern. My mom first taught me to make these. These are wonderful. I love these Jamie Jamie Dove made me two for Christmas and I want more I just don’t think I can make them. I will have to try and make me some. My grandma taught me to make these many years ago. Love them! These are awesome and so easy to make. I Love all of mine. First time I saw this shared I thought it said Grandma’s hotPANTS. Lol. I thought it said hotpants. I was thinking it was repurposing. Oh my. My grandpa use to make them. I taught myself after he passed. They are great!, especially if you have lots of scraps. Love these. Simple to make & they remind me of Memere. I make these, and share them with my family. I love these. I made them for everyone in my family last Christmas and everyone loved them too. Yes they are!! But may I ask what is the color of the yarn? That is a very nice color. I agree. I make them all the time and give them away. I first read that as “grandma’s hot pants,” which sounds way more exciting. Love these!!! Easy to do!! r those the ones u can put your hands inside the triangle to grap things ? These are the double-sided ones that actually protect your hands! I’ve made dozens of these, and given them as gifts. They are the best! If I can get this pattern to come up — which I can’t at the moment! — would you help me with it some night at yarn club? I can sorta-kinda do a single crochet, but really probably ought to learn to be a little bit more comfortable with crocheting, and I like these potholders. (Mine from Grandma — yes — lasted 40 years.) All I can get are the COMMENTS regarding the pattern – not the pattern itself. Grrrr. Lynda, I had to go through about four screens before I found one that said download as a pdf. It does look like a great project. Finally found a link to a Ravelry pattern for exactly the ones I remember. Just all SC, no fancy colorwork. So… probably when we get back from vacation, I’ll tackle these. These hot pads are wonderful! I make them all the time! Have been making these for years. Give them at Christmas and as hostess gifts with a little something else. Ive been looking for this pattern! I’ve been making these for years, family and friends love them! these are so perfect! thank you!! Can the pattern get posted? They sure are the best. Made several. I made these last Christmas as gifts and I make them for friends in their favorite colors. I have made these for years, I don’t know where I got the pattern. The only difference is I always sc through both of the top loops. To me it’s just much more secure. I make these all of the time. Haha … at first glance I thought it said grandma’s hot pants . I have made these for over 35 years. I misread that as Grandma’s Hot Pants. It was a bizarre visual. I’ve made so many of these! I love these! They’re so easy to make. I made my daughter a set. Then I made a set for myself. I need to crank out a stack for Christmas gifts. Sherryl this is for you. I made a couple of these, don’t know how I got by without them all these years ..
My grandma taught me to make these. Every time this pattern pop up I think it says ‘grandma’s hotpants’. There’s only 1 letter difference. I make these all the time and in fact am making some for my niece today. They are my favorite pot holders. I’ve been making these for YEARS…this is the second such “new pattern” I’ve noticed…sad HOWEVER, these make great gifts and work well, if you use cotton yarn…anything else s-t-r-e-t-c-h-e-s- ! Make a lot of these. My grandma taught me to make these many years ago. I had the same difficulty–grandma’s hotpants sounded very scary to me! These are nice if made with cotton. Not worth as sh t made in acrylic. They melt / catch fire. That’s what I see at first every time this pops up–hotpants. I love these, made dozens of them. I am thinking of making some of these..may I ask what price range you sell them for?? Thank you! The only hot pads I use. Love them. I’ve been making these for many years, and my sister’s been making them for even longer. It is easy and quick to do.The double thickness keeps you from getting burned fingers. Every time I see these, I think it says hotPANTS. These are so quick and easy. I have several and plan to make more. They’re so thick too. I have one that my husband’s grandmother made. But it’s acrylic yarn, so not the most practical for really hot things. Now I can make some of cotton or wool!